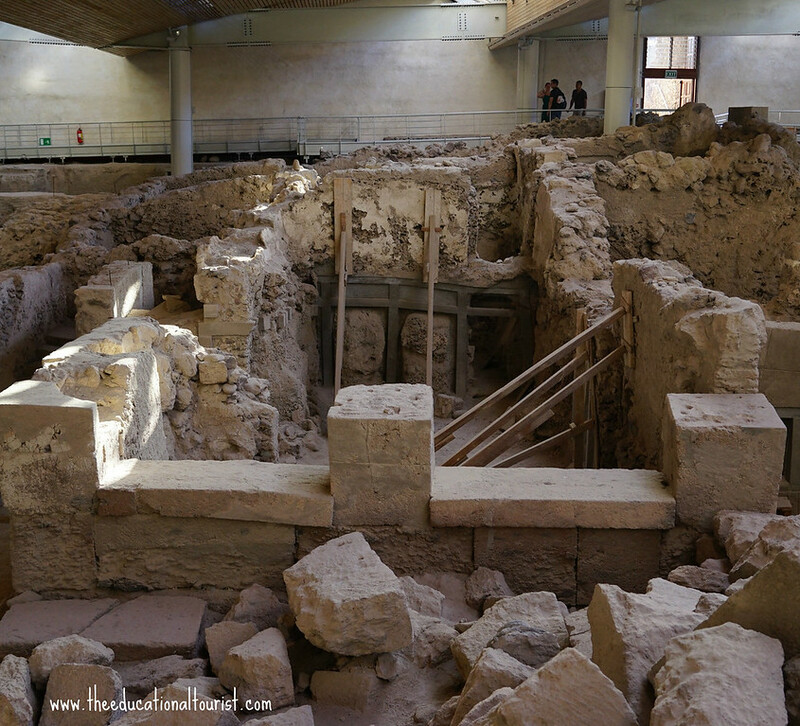 In a country literally FULL of historical ancient sites it is easy to get a sense of overload, especially when you are traveling with the kids. Sometimes just a few stones on the ground are all that is left of some fantastically important place. It is easier for adults than kids to appreciate historic ruins when you have to imagine what was there. On the other hand, Akrotiri in Santorini is just the opposite. It is a MUST see for anyone lucky enough to visit the gorgeous island of Santorini because it is perfectly preserved. Take your time to explore this wonderful spot. It is easy to visit because it is completely covered with a roof making hanging out in the heat and sun a non issue. Akrotini is called the Greek Pompeii because the city is preserved in ash just like Pompeii in Italy. While there is evidence of settlement in this area as far back as the 5th millennium BC, this excavation site is of a Minoan Bronze Age settlement. This was an advanced society with underground pipes for water, paved streets and multiple stories to the buildings. One building even has an indoor toilet! It is interesting to see how these people lived. You can still see vases for food storage sitting just as they held tonight’s food. Narrow alley ways look just like the ones you can see in a visit today to Oia. The perfectly situated island of Santorini made it a great trading spot. 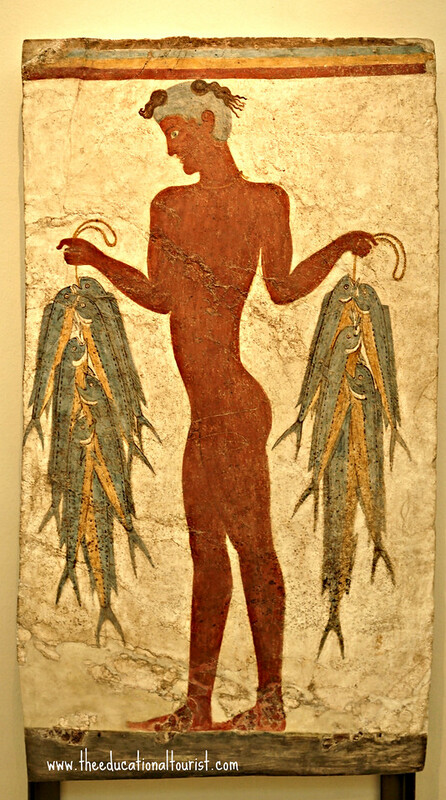 The trade route between Cypress and Crete brought people and goods through Akrotiri including copper. 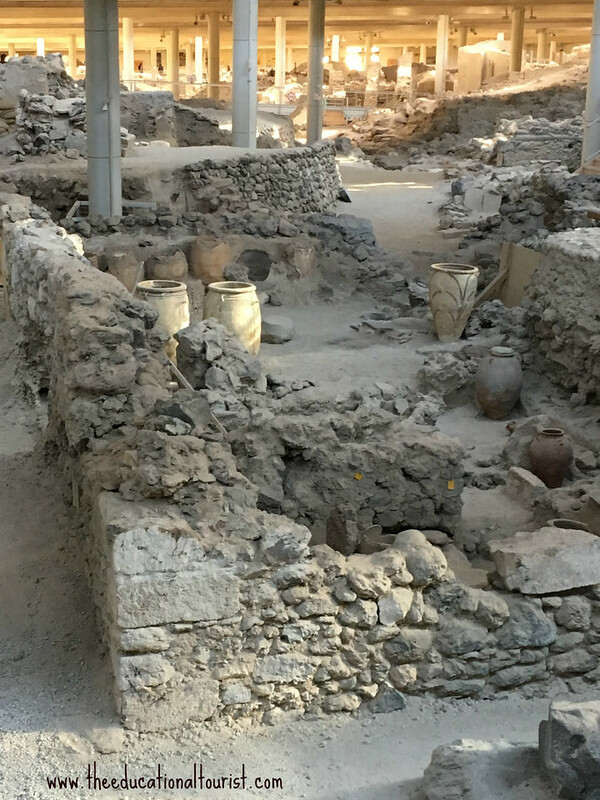 Evidence of processing copper is found in this ancient city. The real treasure here is the art. 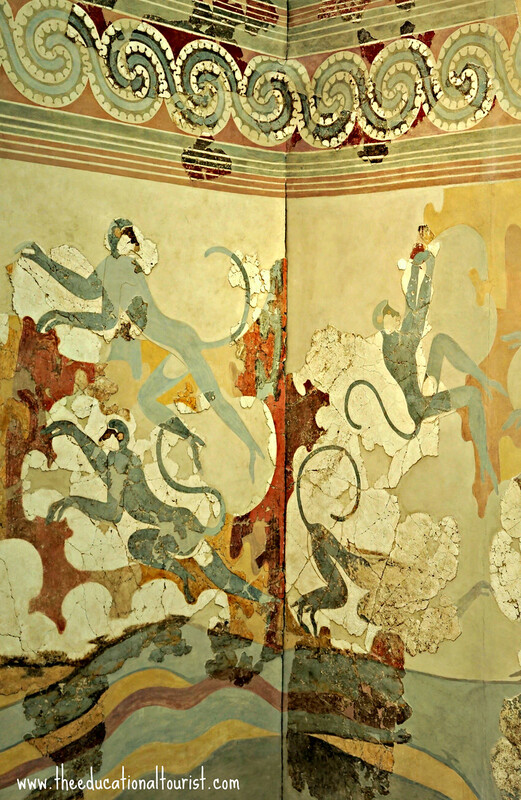 Frescoes were preserved due to the quick burial with ash, just like in Pompeii, and because the pigments were mineral based. These mineral based pantings have stood the test of time. Not only are the paintings beautiful, but they are quite telling about life in this ancient time. We can see plants and birds native to the island. Evidence of their culture shows, too, in these paintings of women along with everyday life of fishing. Some of the animals in these frescos are not native to the island and thus we understand that the population were early travelers to far off countries. As is often the case, the best frescoes have been removed from the excavation spot and put into museums. 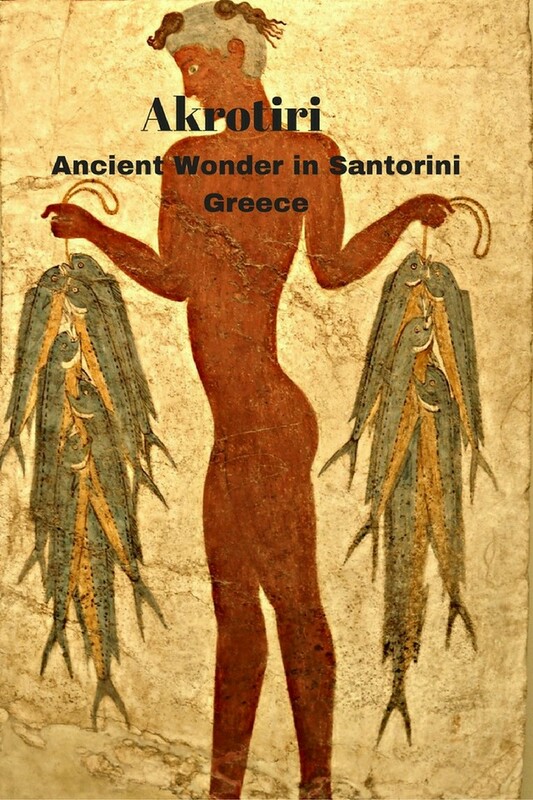 The good news is that some of the wonderful paintings are on view in the Museum of Prehistoric Thira, also on Santorini! Seeing these frescos and other items from the excavation site in person was fantastic. What wasn’t found here were human remains and items of value like jewelry. The residents were warned of an impending dramatic event because of earthquakes. 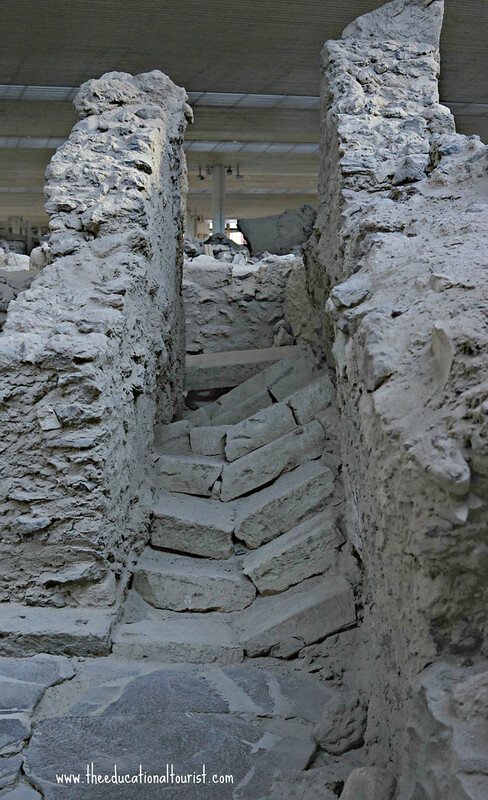 You can see how strong those earthquakes where in this broken staircase. The residents were able to take their belongings and escape to the island of Crete before the eruption. Santorini is a wonderful island with so much to see. Be sure to add this amazing historical site to your list! Natalie Tanner, The Educational Tourist, blogs about making travel fun and educational for the whole family. It IS possible to take kids on a vacation adults want to have – not all vacations have to be water parks. 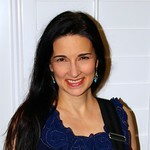 When not traveling, Natalie is mom to 2 kiddos, 2 dogs and a hamster and is always happily planning the next trip. Wow. its really awesome thing you bring out. I never been this places before. I never heared about it even before. I am living in Italy but i only know the santorini is the place in Italy but what its having in it. really appreciate for the sharing. I am sure gonna visit it in coming week.